Currently on view at David Zwirner, New York, is Adel Abdessemed: Who’s Afraid of the Big Bad Wolf. The exhibition is the artist’s second solo with the gallery since 2008 and although much more subdued than his previous, recent exhibitions, subjectively Abdessemed still finds himself dealing with fundamental issues. Who’s Afraid of the Big Bad Wolf encompasses five rooms of the gallery and each room lends itself to a different yet similar visual interpretation of political, social and cultural commentary. Abdessemed assumes the position of interpreter, referencing a historical language in commenting on the current state of global affairs. Previously the artist has utilized live animals or documentation of live animals for his artistic purposes, in Who’s Afraid of the Big Bad Wolf, he has resorted to the much more politically correct stance of making and exhibiting drawings. The drawings of various animals, are kamikaze fighters. Each animal carries sticks of dynamite into an unknown battle. The drawings, made with charcoal on paper, are somewhat crude, and present a certain type of immediacy that gives way towards movement and/or a documentary reportage. Adel doesn’t purport to be a draftsman and says he does his best at rendering the animals to his liking. 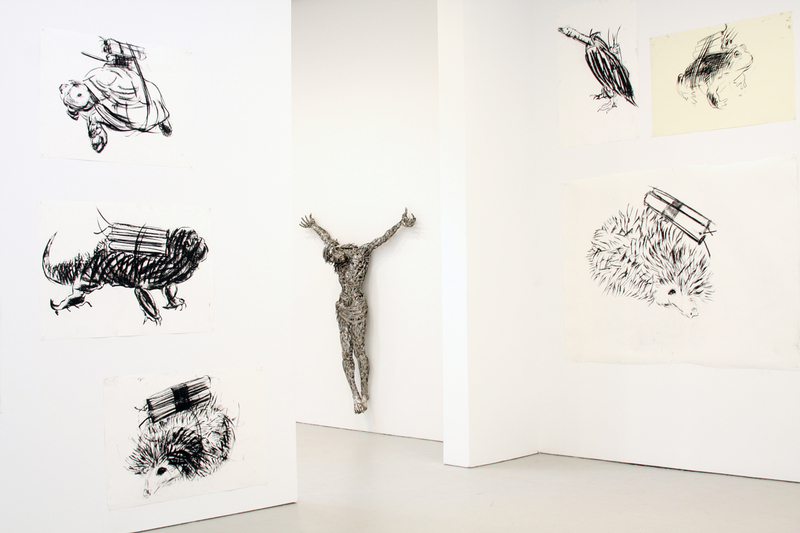 In the room parallel to the drawings hang four representational, sculptures made of barb wire of a Christ image. Across from this hanging installation are several over-sized microphones with globular domed mouth pieces, that glimmer in the light of the gallery. The juxtaposition between the political religious imagery mixed with an exaggeration of visual popular culture is somehow silencing. There is a disconnect between the disparate installation that is quite successful in establishing a quiet moment of impossibility, but the Christ image has been used so often in history, these four sculptures feel anything but fresh. As one walks through the exhibition, he/she will find they are being conceptually guided through three different didactic interpretations in visual format. The first, is the drawings of the animals which declares symbology, the second, are the Christ figures hanging across from the oversized microphones which impart substance and lastly, the final two rooms (depending on where you enter the gallery) are signs which according to the artist, connect the viewer directly to reality. 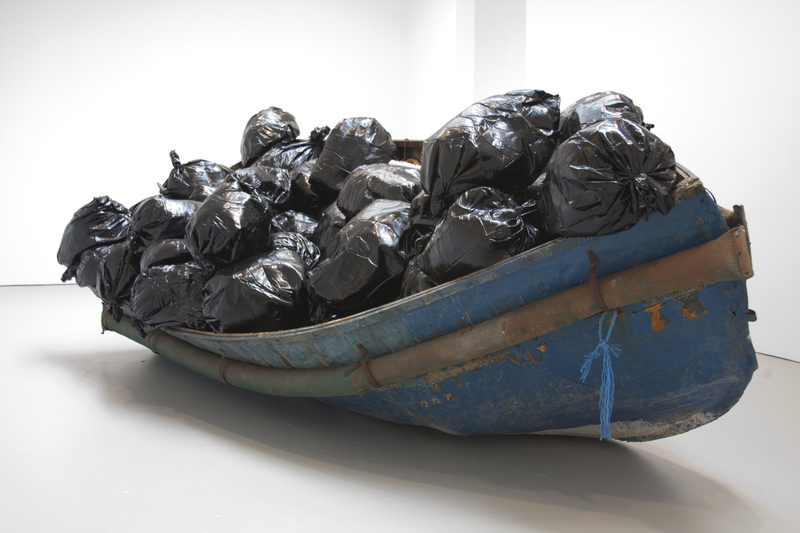 In remarking on immigration and the strife faced by many seeking international asylum, Abdessemed filled a found boat with garbage bags, weighed down with cement. The result is quite striking and one of the strongest, if not the strongest, in the exhibition. A particular level of familiarity and proposed weight of the boat and bags is a compelling and effective interpretation of the impossibility for many who seek a life outside of their home countries/continents. During the press walk through, the artist mentioned Lampedusa, a small island unknown by many, located between Africa and Italy. Only 70 miles away from Tunisia, it is used by police as a facility to house illegal immigrants seeking to cross the border. Since the early 2000’s the island has become a hub for immigrants from Africa, Asia, and the Middle East wanting to enter Europe. In 2004, an agreement was made between Italy and Libya, whereas illegal immigrants who attempted to enter Italy could be legally sent to Libya. Even after this law was established (without the endorsement of the European Parliament) close to 50,000 illegal immigrants have gone through the reception centers on the island, most being men in their early 20’s and 30’s. A full, and weighted boat overflowing with plastic garbage bags, not only speaks to the state of those seeking asylum, but also to class and economic status of these individuals. Lastly, the final room, the largest but featuring only three objects once again focuses on animals, including a video of a monkey using black letters to spell and communicate and a sculptural painting made entirely of small rodent bodies, integrated and monochromatic. The work, according to the artist references Picasso’s famously antiwar painting, Guernica. Also in this room is a free-standing sculpture declared as a monument of defeat. The representational sculpture captures a 2006 moment from the FiFA World Cup between Italian soccer player Marco Materazzi and Zinedine Zidane who then played for the French team, in an on field altercation. In the altercation, Zidane head-butted Materazzi after the Italian player insulted his sister. Abdessemed sees the sculpture as a way to freeze a contemporary moment and in doing so, give it historical value, importance and presence. Who’s Afraid of the Big Bad Wolf, doesn’t necessarily give direct answers or make obviously bold statements but rather is an artists examination of a certain period of time which happens to be now or in this case, 2006 to present. 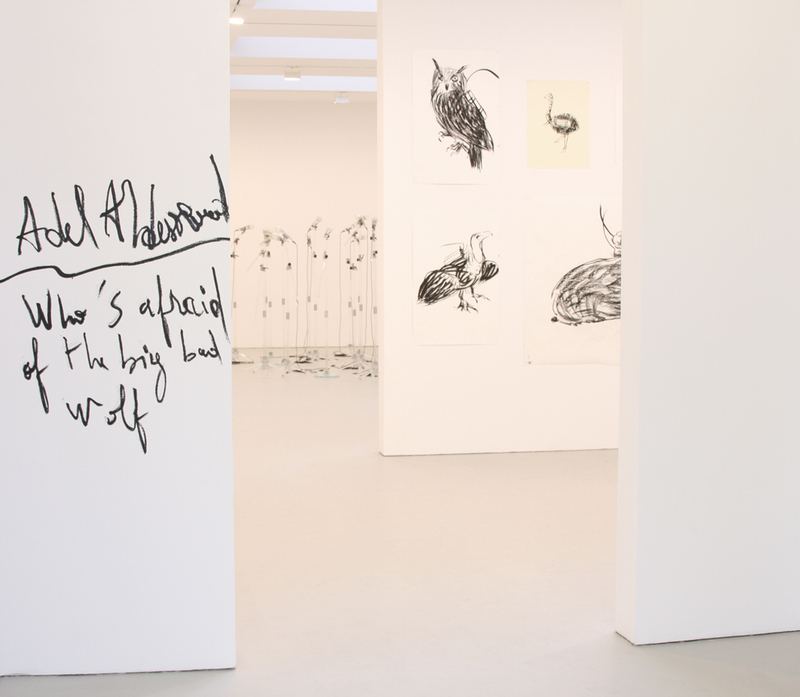 Adel Abdessemed: Who’s Afraid of the Big Bad Wolf is on view at David Zwirner from February 17th-March 17th, 2012.